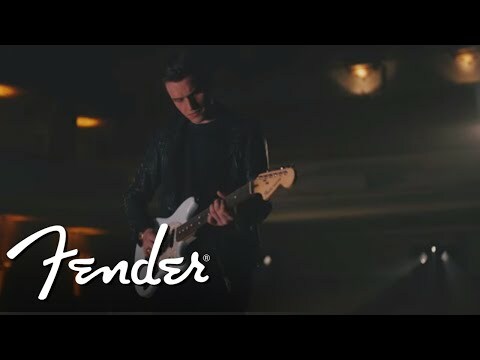 The Fender American Performer Mustang Electric Guitar hails from Corona, California, bringing with it that laid back So-Cal style. Boasting curves in all the right places and a lightweight feel, this Mustang is sure to win over a new generation of followers. Featuring updated hardware and superbly designed Yosemite pickups, it is more responsive and versatile than ever before. Not only that but each one is supplied with a deluxe gig bag to encourage you to get out and play as soon as it arrives. The Fender American Performer Mustang is shaped to the offset waist body profile that we've all come to know and love. Built using alder, the body produces a balanced tonal palette, whilst the ergonomically designed curves establish a figure-hugging feel. Polyurethane provides protection against unwanted blemishes to allow the lush paintwork to age gracefully. Whether you're jamming with friends, hitting the studio or laying it down on the stage, the Mustang is good to go. Connected to the body is a smooth maple neck, which is carved to the modern "C" profile that allows it to sit sweetly in the hand. The shortened 24-inch scale length encourages a warmer response from each note along with a very comfortable playing experience. The satin polyurethane finish prevents unwanted stickiness or tackiness from impeding your movement. Paired with the neck is a luxurious rosewood fingerboard, which yields warmer note from each one of the 22 jumbo frets. The curve of the 9.5-inch fingerboard radius makes it a breeze to execute intricate technique such as string bends and two-hand tapping with flawless accuracy. The American Performer Mustang boasts Fender's Yosemite single-coils, which are designed to maximise tonal potential with a richly diverse palette. The straight-up garage rock and punk inspired tones are yours for the taking. However, the Yosemite pickups enable the Mustang to do so much more. Pickup switching is controlled by the 3-way selector switch, which is accompanied by a master volume pot and master tone pot with Greasebucket circuitry. The Greasebucket circuitry allows highs to be rolled-off without a drop in gain for beefy mid to low-end tones. The American Performer Mustang is home to masterfully crafted ClassicGear tuning machines. Each one is individually anchored with a nut of the front of the headstock and endowed with an astonishing 18:1 gear ratio to give them outstanding performance. No matter how enthusiastically you rock out you can rest assured that adjustments can be executed with the smoothest action. The American Performer Mustang bridge and tremolo features some subtle yet pivotal improvements that significantly improves stability. Everything from the lever mechanism to the dual-point low friction pivot mechanism have been recalculated and calibrated to maintain tuning integrity whilst accommodating light to heavy string gauges. Whatever your preference, the American Performer can do it all.